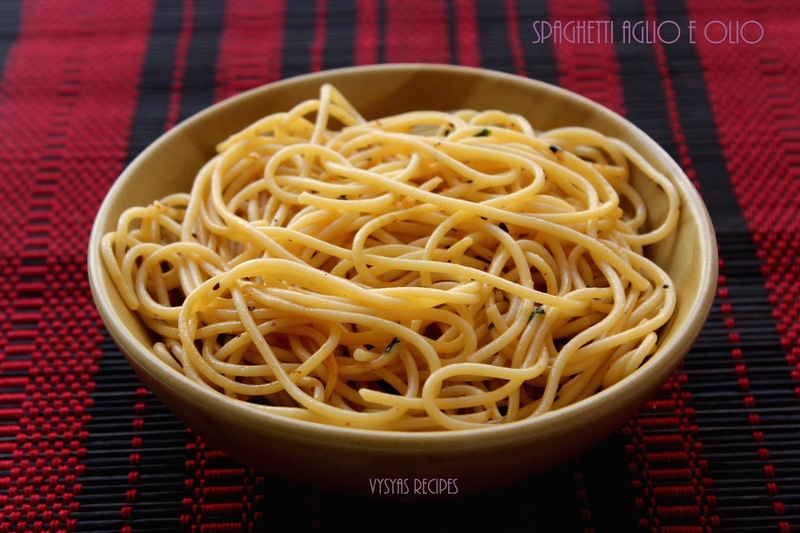 Spaghetti Aglio E Olio is an Popular Italian Recipe made by sautéing Minced Garlic,spiced with Chilli flakes, & Garnished with Parsley or coriander leaves. Spaghetti Aglio Olio Means Spaghetti with "Garlic & Oil ". This is an Easy Pasta recipe, made in jiffy. 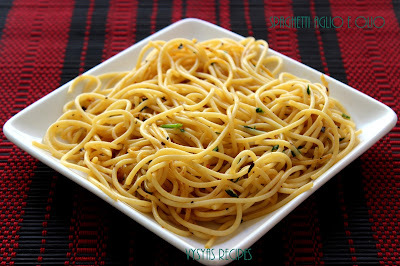 Garlic lovers like this pasta a lot.Cooked pasta when tossed with Roasted Garlic & chilli flakes, tastes delicious.As this pasta is so mild, kids love to eat long strings with mild aromatic flavour. Cook Time : 25 minutes . Garlic - 10 small cloves. Red chilli flakes - 1 tsp. coriander leaves - 2 tbsp. Salt & water - As needed. Chop the Garlic & coriander leaves finely,keep it aside. Cook the pasta, as per instructions. (Take a Wide vessel, and allow water to boil, when it comes to rolling boil, add spaghetti & cook, till soft).Then drain it in a colander and keep it aside. Heat the oil in a pan, add chopped Garlic, when it turns light Golden brown colour, add Red chilli flakes, and saute for 20 seconds.Now keep the flame to low. Then add cooked pasta , chopped corainder leaves, and salt. Stir for 2 - 3 minutes, to combine, and switch off. Aglio Olio is Ready!!! Don't break the spaghetti, use it, as it is. Cook the pasta till al dente (Cook pasta, with firm to bite). Don't over cook the pasta. Instead of coriander leaves, you can add Parsley also. Adjust Garlic, according to your taste buds. you can top with little Cheese, if you wish. This is simple and nice for quick meal. Happy holi to you dear. Kiddo would love this. Simple yet delicious.